This stylish apartment in the Eixample neighbourhood has a perfect, central location. This area is famous for its top notch bars, cafés and restaurants. 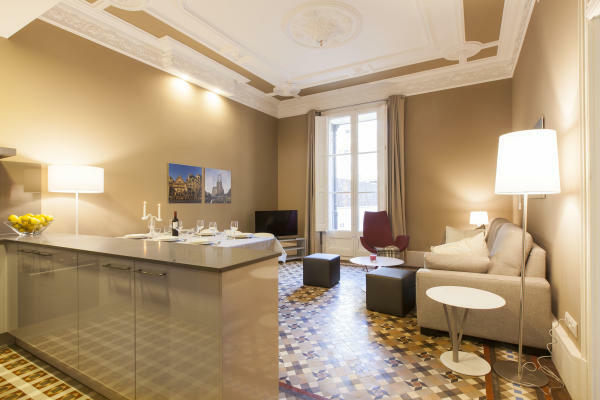 Great attractions such as the Ciutadella Park and the Gothic Quarter are within walking distance and you´ll also find the big square Plaça Catalunya, the world famous Las Ramblas and the beautiful shopping street Passeig de Gràcia close by. This is a renovated Modernist apartment, and you can see features of a typical Eixample home throughout. This apartment can accommodate up to 6 guests with its 3 bedrooms and 2 bathrooms making it an ideal place to stay for a family or group of friends. The apartment has satellite TV with international channels and the living room has a modern yet cosy décor. You can also cook your favourite meals with this apartment´s modern kitchen, fully equipped with everything you´ll need. It also has its own private terrace where you can kick back and relax whilst enjoying the Spanish sun.